Join us on the adventure of a lifetime among elephants and lions, zebras and giraffes… while completely immersing yourself in the joy and excitement of photography. Beginners welcome. We’ve combined all our favorite stops on a single tour… and, thanks to our friends on the ground, we’re taking a step up in luxury, too. All in the company of world-class guides and professional animal photographer Carli Davidson—there to teach you the techniques you need to shoot pictures that sell for $50, $150, $500, or more. If you long for adventure… or a career (or sideline) that helps you travel whenever you like… live wherever you choose… or make an income doing something fun, this trip is for you. Stretching nearly 1,100 square miles from the Tanzania-Kenya border in the north, to the Maasai Steppe in the south, Tarangire contains the greatest concentration of wildlife outside the Serengeti ecosystem. Most known for its abundant population of elephants, it’s also unique for its burnt orange mud that makes the elephants turn red in color. Vast expanses of open space dominated by beautiful acacia and baobab trees make Tarangire National Park the perfect place to capture moody images of African landscapes, set to the backdrop of dramatic clouds on the horizon. It’s a must-stop on this trip for photographers and we pay extra for diesel to go farther into the park than most tourists get to see. You can’t do this on any other tour. Ngorongoro was named by the Maasai tribe as El-Nkoronkoro, meaning Gift of Life, during their migration from Central Africa for a more permanent settlement. We’ll stop at the crater rim for a panorama photo opportunity. And in the morning, we’ll descend into the Ngorongoro Crater. This once gigantic volcano is now the world’s largest intact caldera, sheltering one of the most beautiful wildlife havens on earth. It’s here where you’ll see large herds of zebra, small prides of lion, and elephants bigger than our safari vehicles. We’ll also pass an elephant graveyard and have a chance to see and photograph the rare (and nearly extinct) black rhino in one of the few places he still roams free. 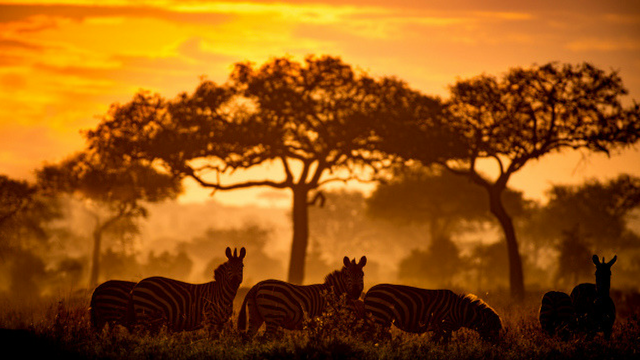 Nestled between the grassy plains of the south and the wooded hills of the north, the Central Serengeti is one of the richest ecosystems the national park has to offer. The vast plains stretch as far as the eye can see—across the sunburnt savannah all the way to the golden horizon. We’ll stay in Moru, known for its kopjes – heads of rock that burst out of the ground like giant bubbles where big cats like lion like to lounge in the mornings and at night. Said to be the 7th wonder of the world, the Serengeti is peppered with acacias shrubs and open grasslands… creating the typical African landscape you often see in photographs. It’s also home to The Big Five (lion, elephant, buffalo, leopard, and rhinoceros) even though rhinoceros are rarely seen here anymore as they are so often hunted for their horns. And we’ll see plenty of cheetah (hopefully catching their prey), wildebeest, and hyena. All in customized Land Rovers made exclusively for photography. November has become our favorite season, too! The transition from spring to summer means the temperatures are comfortably warm, the grass begins to turn vibrant green, and, every night, the sun brilliantly paints the sky a fierce red and orange as it sets on the horizon. November also offers us deeply-discounted rates—almost one-third of what you’d pay on your own—making this trip a true luxury experience. In one of the camps, for example, each tent has its own plunge pool on a private deck. It’s the next level of luxury on an already-great destination. All with the added bonus of traveling with folks who share the same interests as you—a passion for travel and life and a yearning to see the world in a way typical tourists usually don’t. I assure you, not only will you come away with a real passion for this part of the world—having discovered it off the beaten tourist path—but you’ll also learn all the ins and outs you need to take amazing photos… and sell them – a skill you’ll keep for life! Whether you have little experience and modest equipment or you’re already a talented amateur photographer, you’ll benefit from the one-on-one interaction with our guides and photography instructor Carli Davidson. Carli is a two-time New York Times best-selling photo book author with regular photography gigs for pet food companies like Purina. She’s also one of the most down-to-earth and fun people to be around. And she’s a fantastic teacher… which makes learning fun even if you know nothing about your camera. You don’t need a $1,000 camera and tons of equipment to have fun and create images you can sell and be proud of at home. And, this November, we’ll show you exactly how it’s done. Working with animals from a very young age, Carli has a passion for capturing them with her lens and has gone on to photograph and direct commercials for various clients and agencies including Pedigree, Purina, Nike, Friskies, and more. Among others, her work has also appeared in Vanity Fair, Rolling Stone Magazine, and National Geographic. Carli’s ability and know-how to build a full-time career out of a sideline business is just one of the many things she’ll share with you this November as you take charge of your own career or sideline as a photographer. Not only will she share all her knowledge for building a thriving photography business, but she’ll also give you tips and tricks for creating incredible images of animals, capturing their motion, and taking your work to a whole new level. Victor Nyakiriga, our trip leader and ground operator in Tanzania, was born in the Serengeti. At a very young age his grandfather taught him how to track animals and take care of himself in the bush. Years later, he attended the Wildlife College for two years, learning more about natural history and science, camp management, outdoor leadership, ecology, birds, and guiding skills. He then moved back to the Serengeti to live among the animals—tracking lions, cheetahs, leopards, elephants, and the rare rhino by naming them. This helped him better understand their unique animal behaviors and life strategies and eventually landed him jobs working with some of the top wildlife photographers in the business including National Geographic. Before leading safari tours, Victor’s team of guides learned all the ins and outs of Tanzania’s wilderness by working in camps that follow the great migration. Today, they use their expertise to show us the best locations for viewing wildlife and landscapes—areas that most tourists never get to see… areas pristine for photography. Not only do they have extensive training and knowledge of all things wild—mammals, birds, and insects alike—but they’re also well-versed in photography. They know exactly how to position the vehicles and find the best light, so you have the greatest advantage for capturing stunning images. You’ll schedule your flight to arrive on this day or the day before and transfer to our hotel. Most flights arrive at night (5 p.m., 8 p.m. or after midnight). If you plan to arrive a day early, you can arrange a day tour with the hotel, or simply relax and acclimate. Your hotel on that early night will be at your own expense (approximately $160 single occupancy, $240 for doubles). After breakfast on us at the hotel, we’ll do introductions and take you through your first photography presentation, giving you the basics you need to get started. Soon after we’ll make our way to Tarangire. This lesser-known national park boasts an amazing array of diverse wildlife, but is best known for its incredible concentration of elephants. In Tarangire—also known as the “Land of Elephant”—it’s not uncommon to see herds of up to 20-50 elephants roaming together at one time. One of the unique things about our photography tours and expeditions is our focus on getting beautiful and creative images you can sell when you return home. To this extent, you’ll see we’re not only photographing animals on this tour. We’ve incorporated landscapes and opportunities to capture the stunning African sunsets and people. We’ll take you step-by-step through the right camera settings and show you how you can use your camera to turn an average vacation snapshot into a photo worthy of wall space and a magazine cover. In the evening, we’ll do a second game drive at sunset to capture the animals in another light. Today we’ll drive to our lodge at the Ngorongoro Crater. Along the way we’ll stop for lunch at the Acacia Farm Lodge. Perched high on the striking Great Rift’s escarpment area, the Acacia Farm Lodge is situated within an active mixed farm. The lodge’s location bestows stunning panoramic views of the surrounding Karatu farmlands and the nearby Ngorongoro forest area. As we transfer to our lodge at the Ngorongoro Crater, we’ll stop along the way to take in the spectacular view from the rim. Before dawn, we’ll descend onto the crater floor, before other Jeeps make it down, for a pristine game viewing and a chance to see the nearly-extinct black rhino. As a UNESCO World Heritage Site, the Ngorongoro Crater is known for its dense population of wild animals, making it one of the best spots in Tanzania for rhino sightings. This 10-mile-wide volcano top with 2,000 feet high walls is one of the most spectacular places imaginable. Commonly referred to as the 8th wonder of the world, it’s a natural amphitheater for the circle of life. The short grass plains here are rich in nutritious grasses, providing the herds with the best conditions to eat and raise their young—which is why this is also called the time of feast for lions and other carnivores. The game viewing here is among the very best Africa has to offer, and the backdrop is simply stunning. Lots and lots of on-the-ground research has helped us find the perfect Maasai community to take pictures. No tourists. No touristy dances. Just a chance to see a small village the way it is in real life. We’ll go in the late afternoon when the light is right for photos. After class this morning, we’ll take off for our tent camp in the Central Serengeti, where we’ll check in, freshen up, and head out for our first game drive in this area. This is where having local guides who have worked with the world’s best photographers really sets our trip apart. These guys are amazing at what they do. Not only are they friendly and fun, but they’re excellent drivers and expert animal spotters, and they know just where to go to find all the best stuff with beautiful backgrounds. Tonight, if the weather is clear, we can enjoy some time relaxing by the campfire listening to the sounds of nature at night. Early morning we’ll head out on our next game drive, looking for lions and cheetahs who might be on the hunt. Every trip is different, and you may see lions or zebras mating… elephants hanging out beneath the trees… or a cheetah sprinting after its prey. Along the way, you’ll be sure to meet with exotic birds, hyenas, zebras, giraffes, gazelles and impalas, too. While it’s less likely to see the great migration in November—that’s millions of animals traveling together at the same time—it’s still common to see large herds of animals roaming the Serengeti. We’ve added more time to rest and relax… and more time for photo reviews to this itinerary because it’s an important part of this trip. Getting feedback on your work is crucial to improving your skill. Plus, we also have photo-editing sessions planned and Carli is also going to share with you how she sells her images. These tent camps are amazing, too, so you’ll want this time to enjoy them. You’ll be in awe at the level of luxury they put inside each tent. Your windows zip down for floor-to-ceiling views of the Serengeti… and animals walk just a few feet away. It’s not uncommon for them to wander straight into camp. But don’t worry, it’s safe to walk around during the day. The flight back to Arusha is in the morning. You can either schedule a flight home after 5 p.m. on this day, or overnight and catch a flight out in the morning. If you’d like to extend your stay and see more of Tanzania, you have a few options: Zanzibar (an island on the East Coast of Africa)… you can continue on safari to North Serengeti which is famous for its rocks and year-round game drives… you can climb Mount Kilimanjaro or Meru… or also do the Usambara mountains (it’s a chain of mountains you can walk where the landscape is absolutely amazing). If you like any of these options, we can put you directly in touch with our guides for trip planning, pricing, and special requests. You MUST book these options at least three months in advance. If you need a hotel room on this day, room rates are $110 for the day but not overnight, $177 for overnight, $235 for doubles. We like to explore something the average tourist might not know about. We’ve made connections on the ground so we can visit the best sites, markets, festivals, restaurants, cafés, and villages that would be hard to find on your own. We’ll use local guides where possible instead of well-advertised companies and we’ve geared our schedule toward photographers or writers, so you can skip right to the heart of Tanzania and capture something the regular tourist never will. Tours of this caliber typically sell for $15,000 – $20,000 per person, double occupancy, which means you need to share your room with a stranger. But on all Great Escape Publishing photography tours, you get top-notch instruction for taking and selling great photographs and you don’t have to share a room (unless you want to, that is). 75-80% of our business comes from repeat customers—many of them single women—so that’s something that makes us unique. The only time we ask people to share a room is when we reserve a place we know is best and they don’t have enough rooms for us to all have singles. Otherwise we let all our customers have their own space and we don’t penalize single travelers just because they’re single. Easy Payment Plan: If you’d like to take advantage of our easy payment plan, you can register today with just $999 down. When you do, you’ll lock in the discounted workshop price you see today and with just $999 followed by 7 equal monthly payments to pay off the balance. This allows you to spread out the payments comfortably over the months between now and when the workshop starts. What’s more, we know your non-photographing spouse or friend is not going to stay at home while you embark on the adventure of a lifetime. They can pay an extra low rate of $6,899 when they share your room and experience all the drama and adventure of Tanzania right by your side. They can attend as many or as few classes as they want, enjoy all our fabulous dinners, and otherwise attend as a full-fledged attendee. Children must be 12 years old or older or otherwise have written permission from us to attend. Airport transfers are included if you stick to our itinerary, but if you arrive early or stay late, you’ll need to arrange your own airport transfers through the hotel. We can help you with this. Equipment—you must bring your own camera and accessories (e.g., memory cards, tripod, etc.) If you don’t own a camera or you’d like to rent or buy a different lens, we’ll tell you exactly what to get. Gratuities—at this level of service, gratuities are expected even when they say they’re not. Please allow $20-$30 per day for this. All skill and experience levels are welcome, and the concepts introduced are doable by anyone. Point-and-shoot cameras are welcome. Most of this workshop will be spent out-and-about in customized Land Rovers made for photography. Game drives during the day can be quite long, often sitting for several hours and bouncing around on the very bumpy, un-paved roads. While this may not be considered strenuous activity, it can be uncomfortable and physically demanding on the body. On this expedition, you must be able to climb in and out of the raised safari vehicles and be able to stand on your seat in the car in order to shoot photos from the roof. Please understand that if you are unable to get up and down on your seat, you may be limited to only shooting out the side window. A fine option but please understand your own physical limits. You should also be able to walk around our camp accommodations, sometimes over uneven or rocky terrain. Rooms are spread throughout the property. This means you may have up to a 5-minute walk to your room (with a guide) from the main area, so please be prepared for that or let us know ahead of time if you have physical limitations. If you are unable to keep up with the group, you might not be able to participate in an activity. If you have concerns about physical limitations, please contact a Great Escape Publishing staff member before registering. You can email us at workshops@greatescapepublishing.com or call (561) 860-8266. This workshop is a once-in-a-lifetime opportunity for folks who truly want to get paid to travel. Not only will it include loads of exploring the fascinating country of Tanzania, but you’ll have the opportunity to sit down with Carli to go over the photos you’re taking and learn how to improve. You’ll get in-the-field guidance and loads of help with your camera settings, too. You’ll learn a LOT in 10 days, and go home with some amazing shots. “The workshop was fun. I learned a lot… I met interesting people and I became excited about trying to make money from photography. The workshop is an excellent value and provides information that is difficult to acquire in other ways.” – Susan H.
“I learned more in three days than I have all year. Between Thursday’s photos shot and Saturday’s photo shots – it is like night and day.” – Lynda I. PROTECT YOUR INVESTMENT: We strongly suggest you protect your investment by purchasing trip-cancellation insurance. We recommend using sites like Insuremytrip.com to compare rates or purchasing through your airline when you buy your plane ticket. We will send you details about trip insurance in an email following your registration. It’s not right for everyone so we’ve done some research on your behalf. CANCELLATION POLICY: The Tanzania Photography Expedition is non-refundable. If we can fill your seat with another paying participant before the event, we can offer you a Workshop Credit good toward another event in the amount of what you paid minus a $500 credit card processing fee. Refunds to your credit card are not permitted. If you cancel due to reasons that are covered by your purchased travel-insurance policy, we will advise the insurance company that your travel and conference fees are non-refundable.